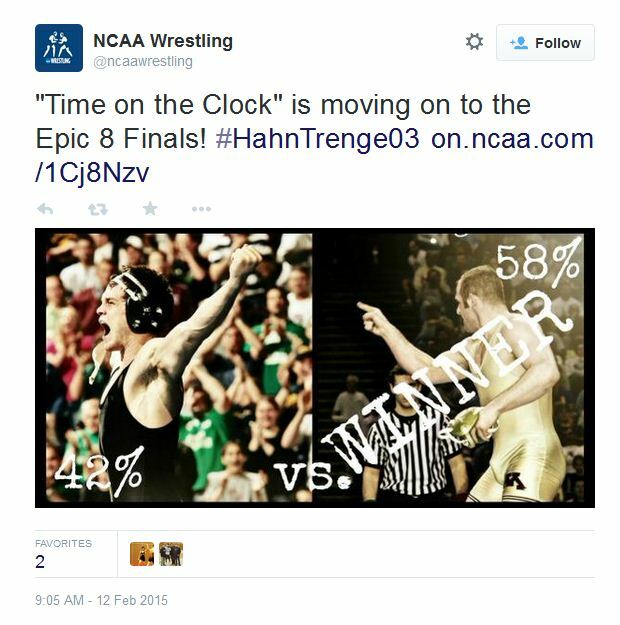 Fans on social media will determine the most epic NCAA Wrestling finals match in history. Today fans will choose which match will advance to the championship round. Will it be The Grudge Match or Time on the Clock? Fans can vote by clicking below, or by tweeting using the customized hashtags for each match. The match with the most votes by Thursday, Feb. 12 at Noon ET will advance. Two-time defending champion Johny Hendricks of Oklahoma State had owned the series against Iowa’s Mark Perry in their individual matches at 165 pounds. One of those signature wins came in the 2005 NCAA finals, where Hendricks beat Perry 5-2. In the 2007 finals, with Hendricks coached by Perry’s uncle, John Smith, Hendricks would take a 2-0 lead in the third with a reversal, but Perry countered with a reversal of his own to tie the score with a minute to go. Perry threw in legs and a deep half to get two nearfall points with 30 seconds left to give him a 4-2 lead. Hendricks would get free with under 10 seconds left, but didn’t have an opportunity to score late. "If there's time on the clock, there's time to wrestle." Those words uttered by Minnesota 197-pounder Damion Hahn after his dramatic 5-4 victory over Lehigh's Jon Trenge in 2003 have become a mantra for last-second comebacks. Trenge, who battled vision problems associated with a detached retina, sported protective goggles during the last three years of his career, but it didn't stop him from reaching the finals and leading Hahn 4-3 with 11 seconds remaining. On the restart, Hahn attempted a lateral drop, then popped behind Trenge and brought him down to the mat for the winning takedown with only three ticks left.